[The summary of the life of Padre Antonio José Martínez of Taos by William Wroth, author of The Talpa Chapel and Images of Penance, was posted on the website of the NM Legislature http://www.newmexicohistory.org/. I have taken the liberty of making a few edits and corrections, e.g. that Padre Martínez was “a Franciscan priest”. He was actually a “secular” or diocesan priest ordained in February 1822 at Durango, Mexico a year after its independence from Spain. New Mexico was part of Spain’s Nuevo Mundo for two-and-a-quarter centuries (1598-1821), and remained the northern frontier of the Republica de México for another quarter century until the American occupation in 1846. After the 1848 Treaty of Guadalupe Hidalgo, New Mexico became a territory of the United States, and the Pontifical Congregation for the Propagation of the Faith Apostolic in 1851 established the Vicariate of Santa Fe, dependent on the Archdiocese of St. Louis. A few years later, Santa Fe became a diocese in its own right with Bishop Lamy as its appointed leader. Father Antonio José Martínez (1793-1867) was one of the most important New Mexicans of the nineteenth century, playing a leading role in both religious and political affairs in the Mexican and Territorial periods. Antonio José Martínez was born the eldest son on January 17, 1793 [the feast of desert father San Antonio Abad] in the Plaza of Santa Rosa, about two miles west of today’s Abiquiú. At the “public school” connected to the parish church [of Santo Tomás], he learned to read and write at a very young age. When he was 11, in 1804, the family moved to Taos where he worked on the family ranch and helped to take care of his younger brothers and sisters. At the age of 19, he married María de la Luz Martín of Abiquiú, [Wroth parenthetically asserts they were not related,but they were were cousins a few degrees removed-JR] but tragically she died a year later in childbirth. The young widower returned to Taos to live with his parents. Still in his early twenties, he decided to become a priest, and before turning 24 [María de La Luz died when he was 20; after a couple of years of discernment], he went to the seminary in Durango in northern Mexico. It was the seat of the far-flung diocese that also included what is today called the American Southwest. At seminary, he excelled in his studies, especially philosophy and canon law, and received a scholarship given in honor of the King of Spain. Antonio José Martínez was ordained a priest in February 1822 for the Diocese of Durango that included all of New Mexico [that included at the time a great swath from what are snippets of all the states today surrounding NM]. This prior year Mexican Independence from Spain had taken place, and that struggle for independence strongly influenced Padre Martinez’ political thinking. He was supposed to stay for another year in Durango to continue theological studies and receive pastoral experience before returning to NM. However, suffering from an asthmatic condition, he received permission to return to Taos where he lived with his parents while helping out the Franciscan pastor of the church of San Geronimo at the Pueblo. Its missions included Padre Martinez’ home parish of Our Lady of Guadalupe at the Plaza. He fully regained his health to fulfill an active ministry fist in Taos for a couple of years and then for a few years in parishes at Tomé (south of Albuquerque) and Abiquiú (northwest of Santa Fe, and about sixty miles southwest of Taos). Spanish New Mexico had since the early colonial period been under the religious administration of the Franciscan friars, but after independence, there was a powerful movement to replace these Franciscans with secular priests. In 1826, Padre Martinez became the priest in charge of the parish in Taos: San Geronimo of the Pueblo, Our Lady of Guadalupe of the Plaza and other surrounding mission churches. This was also the year of the arrival of a sixteen-year old Christopher (Kit) Carson into Taos that he made his home, and the year of the death of the Padre’s father, Severino Martinez who had been the Sheriff of Taos. Soon after his appointment as the priest of Taos, Padre Martínez opened a school that was for young girls as well as boys. It was the first of several schools he established in the Taos area, including a seminary (1835) and a law school (1846). 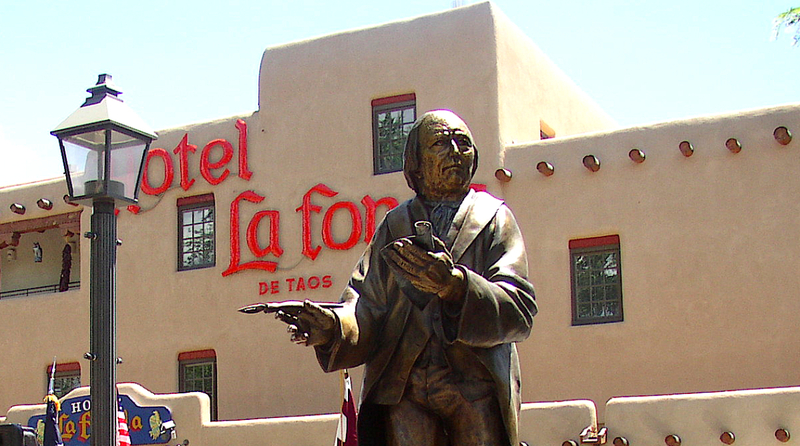 In 1834, Ramón Abréu brought a printing press from Mexico to Santa Fe. It was the first press to operate in New Mexico, and the next year Father Martínez purchased it, and moved it to Taos. Martinez used the press to print schoolbooks—spelling, arithmetic, etc.– as well as religious and political tracts. He established the first newspaper west of the Mississippi, El Crepúsculo de La Libertad, but only six issues were printed. He published the first book printed in New Mexico—a bilingual ritual (Latin and Spanish) called A Manual for Pastors. After the Chimayó War of 1837, Padre Martinez wrote and published on his press his own autobiography—a kind of melancholy mid-life memoir cataloguing his accomplishments. In that violent Rebellion, centered in the town of Chimayó, Martínez was accused of playing an organizing role. However, the evidence suggests that he was innocent of any involvement and in fact, was in danger at times from the rebels. Martínez, as a Mexican liberal of the period, was opposed to President Santa Anna and to his appointed New Mexico governor Albino Perez, who was assassinated by the rebels. With the change in sovereignty from Mexico to the United States in 1846, Father Martínez was accused of being, on the one hand, too tolerant of the incoming American Protestants and, on the other hand, anti-American and even an organizer of the Taos Rebellion of 1847. [Cf. “Padre Martínez: the First Mexican American” in Seeds of Struggle, Harvest of Faith – 1998, LTD Press]. Both accusations were not only contradictory but also unfair. He believed in religious freedom and admired that principle in the American constitution. He maintained good relationships with most of the Anglo [Americans who had settled in Taos. General Stephen W. Kearny, after occupying Santa Fe in mid-August 1846, had Padre Martinez come from Taos, and invited him to pledge allegiance to the American Flag. The Padre, together with is brothers, were among the very first New Mexicans to become citizens of the United States. Padre Martinez lent the General his printing press, and Kearny used it to print his famous code of laws. During the Taos Rebellion (in January 1847, during which Governor Bent was assassinated), Padre Martinez provided sanctuary for at least one endangered American, and he confronted the mob of rebels…He also cooperated fully with Colonel Sterling Price who made Martinez’s home his headquarters while he and his troops fought and defeated the rebels. The soldiers of Col. Price fired cannon balls into the venerable Pueblo Church of San Geronimo—over two and a quarter centuries old—killing over 225 people including women and children who were seeking sanctuary. The Padre gave some of his property for the burial of the fourteen Americanos and sympathizers who died in the 1847 Taos Uprising. He buried in the parish church graveyard at least eight of those who were hanged for leading the defense of the Mexican nation in its northern outpost, and another four or so in the burial grounds of the Pueblo. In 1849, Martínez was appointed president of the convention of nineteen delegates assembled to prepare a territorial plan of government. In 1850, Padre Martinez presided at New Mexico’s first territorial constitutional convention that ratified New Mexico’s becoming a territory of the United States, free from slavery. The arrival of Bishop Jean Baptiste Lamy in1850 brought about a long-lsting conflict between the French clergy under Lamy and the New Mexican-born clergy for whom Martinez often served as the spokesman. In December 1852, Lamy…declared that parishioners who did not tithe (pay church fees) would be denied the sacraments…Martínez had some twenty years earlier been successful in having involuntary tithing abolished in Taos due to the poverty of the populace. On behalf of a number of the clergy, Martínez took issue with Lamy’s position, and this issue remained a major thorn of contention between them for the rest of Martinez’s life. At the same time, Lamy suspended some New Mexico-born clergy from their priestly duties. Among them, Father José Manuel Gallegos, pastor of the church in Albuquerque and a former seminary student of Father Martínez. Lamy’s action produced a powerful backlash; not only did Martínez come to Gallegos’s defense, but over 900 citizens signed a petition in support of him. Blog about Padre Antonio José Martínez, Cura de Taos. When he died, his peers in the USA Territorial Assembly for NM wrote on his epitaph, "La Honra de Su País" – The Honor of His Homeland. The last decade of his life–in the years following the American occupation– was clouded by controversy with his new bishop. Fray Angelioc Chavez in My Penitente Land called him "New Mexico's greatest son." This blog is dedicated to the life and legacy of this priest, educator, printer-publisher, lawyer-politician, rancher, patriot.